Rays sixth in runs scored last two seasons? It can’t be true. Well, it is. 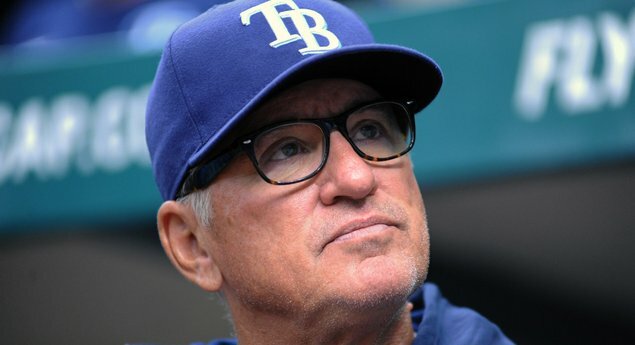 Joe Maddon and the Tamp Bay Rays are one of the most efficient teams in baseball the last two seasons. Who would've thought a team with Evan Longoria planted in the middle would be so strong at the plate. McGILLIGAN: When I read it, I was shocked. There’s no way that could be true. Peter King must have misheard him. I need to check baseball-reference.com. Most interesting 10-minute conversation last week: chatting up Joe Maddon before the game. “Everybody says we’re a pitching and defense team, and we are, I guess,” he said. “But did you know that over the last two years, we’re sixth in the major leagues in runs scored?” That I didn’t know. The Tampa Bay Rays were sixth in runs scored for the last two years? Whenever I think of the Rays, I think pitching and Evan Longoria, in that order. However, a quick check on baseball-reference confirmed it. The Rays had scored 1,509 runs combined in 2010 and 2011. Only five other teams including the New York Yankees (1,726), Boston Red Sox (1,693), Texas Rangers (1,642), Detroit Tigers (1,538) and the Cincinnati Reds (1,525) had scored more. How did this happen. Checking the numbers didn’t immediately make sense. In both seasons, the Rays had finished second to last in hits in the American League, only the lowly Seattle Mariners had less. They were only one or two homeruns above the league average both seasons, so that doesn’t explain it. After staring at the numbers, it dawned on me – the Rays are the most efficient club when it comes to hitting. This had to be the case since they didn’t smash the ball out of the park and had low hit totals. Turns out, it’s true. The Rays had the second-highest percentage of extra base hits of any of the top six teams. This is how the Rays are able to produce runs on par with the loaded lineups. It’s a simple process, extra base hits are more likely to produce runs by either driving others in or by getting into scoring position. The Rays do it better than just about everyone in baseball. During the two seasons, the Rays were second only to Boston in terms of the percentage of their hits that went for extra bases. During the past two years Boston’s bats produced extra base hits in 37.9 per cent of its at-bats. The Rays percentage was 36.5. The Rays had 444 less hits in that time frame than the Red Sox. As a Red Sox fan, I’m happy that of the top six run-producing teams in the past two years we have the highest percentage of extra base hits. However, I nearly threw up when I calculated this number: $210,299,167. Using the rosters on opening day, it’s the combined difference between the payrolls of the Red Sox and Rays during the past two seasons. Add to that back-to-back Rays playoff appearances and its official – Tampa Bay is the most efficient team in baseball in so many ways.